I was obviously not meant to have this Mini. I originally purchased the maroon Mini Clubman (1975 Model) from a friend named Bo Griffiths for a princely sum of $700. This to me seemed a fair prince as the car went well and while the paint was faded the car was structurally perfect (ie. no rust!). Anyway I enjoyed driving around in the car for a while until one November day I was driving through a Canberra suburb and whamo there they were conducting car inspections and proceeded to give me a defect sticker. I had it inspected and the guy (at Discount Tyres) gave me a list as long as your arm. He also had a "mate" who would take it off my hands for $500. I told him to stick it and drove off in my defective car! I cancelled the remaining registration on the vehicle and put it in the garage waiting to save up the money to fix it. During this time I realised that my current financial state did not allow me the luxury of a sports motorcycle and a Mini. So I did the smart thing and sold the motorcycle (1999 model GSXR 750 Suzuki). I didn't really like that particular motorcycle anyway and got a very bad deal on the sale (bought for $12,000 in Feb 1999 sold in May 2001 for $7,500). But at least I now had a bit of cash to play with. On the 6th of July 2001, I was involved in a three car pile up. A girl came to a complete stop to take a right hand turn and I came to a complete stop. An old guy in a van failed to stop and ran into me pushing me into the girl in front. The boot was complete crushed in and the car a complete write-off. I didn't get around to taking any photo's so you will just have to take my word for it. I then spent 5 weeks writing stern letters to this old guy so that he would submit a claim (I was not insured as I had only had the car back 3 days, still no excuse) so I could get some money out of him. I confirmed that his insurance company had no right to my vehicle and proceeded to start fixing it as best I could. So I went over to my parents place, who have a double garage. In order to get at the quarter panel I had to take out the right hand tank (yes twin tanks!). The only trouble was that I successfully lifted it over the battery to get it out. I guess in my impatience I forgot to take the battery out. Mainly because I thought the possibility of a fire was fairly remote. You can see what's coming can't you. Anyway to make a long story short, I completed repairs and had a functioning rear indicator and break light and proceeded to move the tank back, while I was doing so the base touched the battery and arced the terminals creating many sparks. It seems that the vaupour inside the tank ignited and I had my hands on a huge flame thrower. This proceeded to send lit petrol cascading down the side of the car and lit the carpet. Within what seemed like seconds there were flames 8 feet high inside the garage. I decided to let go of the tank and rushed for the water hose. 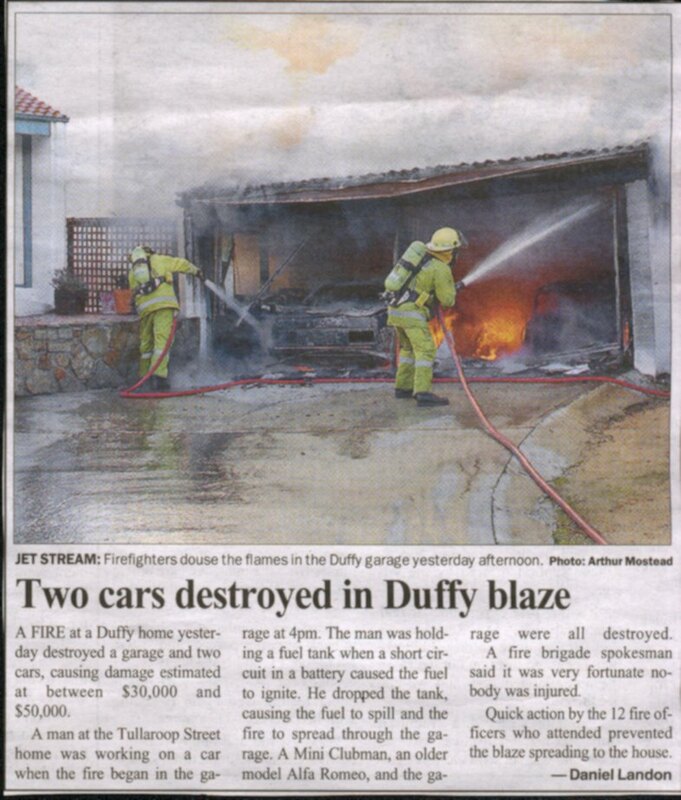 By this time the garage was well and truly alight. I went inside and called the Fire Brigade and and then went out to stop the fire speading to the house. When I ventured out again there were people everywhere. I grabbed the hose and proceeded to spray water as best I could. There was so much heat that even 15 metres away my fringe still caught on fire. I managed to make page 2 of the Canberra Times (though the reported makes me seem like a complete blouse!). But I will not give up on my Mini Project. Please go here to see what I intend for my next Mini. Oh and one small piece of advice for anyone working on Mini petrol tanks...take out the battery!. And another piece of advice for everyone...Insure your vehicle!